Our Intellectual Property Litigation Group understands the challenges facing individuals and businesses that find their valuable rights, ideas, and information at risk. Defending these rights requires a coordinated and reasoned approach, whether it involves proactive enforcement or responding to legal claims in both stand-alone proceedings and larger business litigation disputes. Our attorneys have considerable experience guiding clients through the challenges and risks associated with protecting and enforcing their valuable intellectual property rights. We have litigated a wide variety of intellectual property disputes, including copyright and trademark infringement as well as trade secrets, licensing, and distribution disputes. We have handled intellectual property disputes in courts across the country, including state, federal, and Trademark Trial and Appeal Board proceedings. We defended a distributor of children's toys against a copyright infringement claim. We counterclaimed on the client's behalf and resolved the matter for a fraction of the plaintiff's demand. We defended an assisted living facility in one of the few architectural copyright litigations in the District of Oregon. The matter was settled prior to trial. We defended a company against a Bit Torrent copyright trolling lawsuit. The holder of intellectual property rights in a major motion picture sued our client based on the use of the client's server to download the file. After much back-and-forth, we persuaded the plaintiff to dismiss our client. We have also represented individuals in such trolling lawsuits. We assisted a family business in Southern Oregon in responding to competitor's demand to redesign its product. We defended an entertainment industry client against a class action copyright lawsuit. We have assisted businesses and individuals in responding to cease-and-desist letters from content creators, especially with respect to use of visual works. We represented 20th Century Fox in enjoining a theater from showing unlicensed copies of its films. Our attorneys have represented Viacom, Inc. in intellectual property and contract-related disputes, including a dispute concerning distribution of a major motion picture. We represented a national insurance brokerage company in federal multi-jurisdictional litigation involving misappropriation and unfair competition claims against a major competitor. 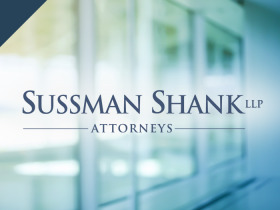 We resolved trademark infringement matter for client by successfully demanding that infringing party immediately cease and desist all use of client's trademark due to likelihood of confusion, dilution, and claims under the Unlawful Trade Practices Act. We persuaded a major food delivery service to cease and desist from implying an affiliation with famous Portland restaurant. We have resolved trademark infringement matters through declaratory judgment actions in federal court. We have represented Bob's Red Mill Natural Foods before Trademark Trial and Appeal Board, as both opposer and registrant. We have represented the Sweetwater Company (EARTH2O) in TTAB opposition proceedings.